A few days ago, a writer emailed me, hoping to be on The Bat Segundo Show. I responded quite politely, as I do with all those who pitch me directly — pointing out that the show was heavily booked. But if he wanted to send me his book for consideration, he was more than happy to. However, due to the fact that I receive more books than I can possibly read, I couldn’t promise anything. He responded. 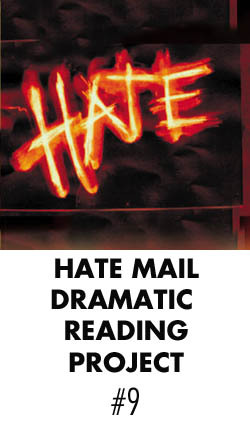 The following clip represents my dramatic reading of the hate mail in question, read in the style of a Tennessee Williams protagonist.